If you always go for the best of the best, you should definitely visit Casino Cruise. 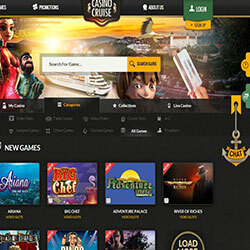 The style of the site is quite different from other online casino sites, as the whole theme was heavily inspired by fancy boat cruises. Casino Cruise is one of the fastest online casinos we’ve ever tried. Navigating the responsive layout is a peace of cake and the whole experience is stunningly smooth, adding to the sense of luxury. The live chat icon is pinned to the bottom of the site so you can contact customer support should you have any inquiries. When players highlight the live casino button they will see male and female dealers, dressed in pretty uniforms. This aspect also helps to elevate the overall cruise atmosphere. Regular promotions at Casino Cruise include boat cruises for two with all expenses covered. The destinations vary, sometimes it’s the Carribean, sometimes it’s the Danube. If you like cruises and casino gaming, Casino Cruise won’t disappoint. Casino Cruise will satisfy all your gambling needs, no matter what you`re searching for. Thanks to the award-winning software solutions offered by EveryMatrix, Microgaming, NetEnt, Play’n Go, Vivo and Nyx, Casino Cruise offers astounding gaming experience for players all around the world. The game selection of Casino Cruise is truly breathtaking. With 30 different blackjack games, this site has the potential to become the paradise of blackjack enthusiasts. By visiting the games section of their page, the player gets access to numerable wonderful games. At Casino Cruise you`ll have immediate access to the newest releases and established casino classics, too. They have over a thousand games on offer, so it`s literally impossible to get bored if you choose this destination. All slot enthusiast will be pleased with games like the acclaimed Ariana Slot from Microgaming or Dracula video slot from NetEntertainment, among many others. When it comes to blackjack it`s hard to outraise Casino Cruise. The Premier High Streak Blackjack, Spanish 21 Blackjack and Double Exposure Blackjack are only a few from the yaw-dropping variety. If you are a player on the move, you`ll be sure to enjoy the easily manageable mobile page of the destination. You won’t miss any action, since all the leading mobile systems are covered, and the games run just as smoothly as on your desktop. Make sure to check out the lavish portfolio of this site, by using their great 1st deposit bonuses. Casino Cruise not only differentiates from other destinations by their amazing customer service, promotions or the number of games, but also by the system used by them. They operate with Everymatrix, the renowned provider with a selection of games from NetEnt, Microgaming, Play’n Go, Vivo and Nyx. Casino Cruise has an outstanding variety of Blackjack games. Amongst the 30 Blackjack variations, you will most probably find at least one for your liking. Multi-hand Premier Blackjack Gold, Single Deck Blackjack, Vegas Strip Blackjack and European Blackjack and many other awesome 21 games are included in the lavish table games section of the casino destination. One of the many advantages of Casino Cruiseis that they offer over a thousand games. 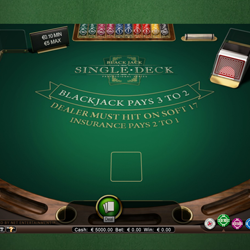 Under the games menu, the casino destination managed to group their games into clear-cut categories. It is really easy to coordinate between the 6 classes of games. The range of their slot games varies from classics to the newest 3D releases by the best providers in the industry. 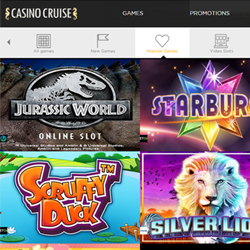 Take a chance on the Treasure Island slot, the River of Riches slot or classics like the Safari Madness slot or Mystery Joker slot. .
You can find plenty of table games to take advantage of Casino Cruise`s numerous offers. Check out different kinds of European Roulette, American Roulette, Premiere Roulette, English Roulette or the Multi Wheel Roulette Gold. Just scroll through their extensive catalog to find your favorite. Casino Cruise is one of the brightest shining stars in the casino industry. This fact has been backed by the Best New Comer 2015 prize of the iGB Affiliate Awards. They combine a wonderful portfolio of games with amazing bonuses and all this in a luxurious environment. Their customer service is always there to help, and the numerable payment options just add to the awesomeness of the casino. Casino Cruise offers a beautifully designed live casino, with gorgeous live dealers. Check out all their amazing live Roulette and Baccarat tables. The mobile version of the site runs smoothly on all devices. Just type the URL of the casino into your browser, and enjoy all their games while on the go. 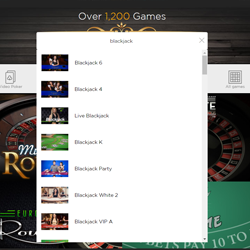 All the Video Slots, Table Games, Jackpot Games, Video Poker and even the custom games are available on your device.